The salvation found in Christ is a powerful message that deserves an equally powerful emblem. Apples of Gold has just the right gold cross pendant to capture the essence of the Christian faith. 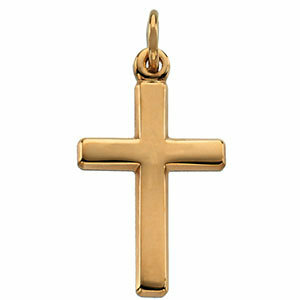 This solid gold cross pendant is comprised of the finest 14K yellow gold for a classic style. The pendant's clean lines intersect perfectly to form the well-known cross shape. This excellently-proportioned gold cross pendant is plain but with a brilliant polish, making this a simply powerful piece of jewelry. 16.5mm x 12mm (5/8" x 1/2"). This cross pendant is suitable for a woman, because of its petite size. We guarantee our Small Polished Cross 14K Yellow Gold to be high quality, authentic jewelry, as described above.